This sheet covers the most common spending categories for a household's budget. It focuses on items that are 'under your control', which are also known as discretionary spending or variable spending. There are really two parts to a monthly budget. The first is fixed costs such as housing, utilities, debt payments, etc. Those payments are there every month, they don't vary month to month, and they typically don't go away. If you miss one of these payments it can be bad for your credit or worse. This sheet focuses on the variable part of your spending. These are categories you have more control over (food, entertainment, savings, etc). Of course everyone ends up buying food; but you could decide to eat out five times a week ($400/month) or stay home and cook macaroni and cheese ($40/month). With this sheet you can see where your money is going and keep track of it. For couples the real beauty is it puts all your spending choices out in the open. Since the spending this sheet tracks is discretionary, it allows you to set goals (or limits) in each area. By tracking what you've spent in each category you know if you can go ahead and treat yourself to eating out, or if it is time to open that box of mac and cheese. The categories we selected are general and should work for most households. Given that we fit all this onto a one page sheet it took some compromise. If you want to to setup your own categories, try the template without predefined spending categories. Groceries / Food - what you buy at the store, what you spend at restaurants, and what you spend in coffee shops. Savings / Debt Reduction - yes budget for this! When you prioritize paying down debt or saving money as part of your budget, it is called "paying yourself first". This is a cornerstone of building personal wealth. If you have a significant other, being on the same page about this is priceless! How you actually use the categories is up to you. You can be as consistent or inconsistent as you like. After all it is your money! Say your food spending is high for the month but your fun money is low. Go ahead and treat yourself to eating out if you like and count it under the fun money category! As you know, our mission is to help households manage their finances with ease and confidence. There's a secret of the world sitting in plain sight when it comes to how you allocate your money. We'll say again - it is your money and you can choose to spend it however you want. However, in the immortal words of Benjamin Franklin "An investment in knowledge pays the best interest." What he means is prioritizing education (formal or informal), personal growth, and healthy activities pay the best benefits later (higher paying job, more choices in life, higher self esteem, self actualization, etc). 1) Start each month with a fresh print out. Write in the month and year. Set your spending goals for each category. 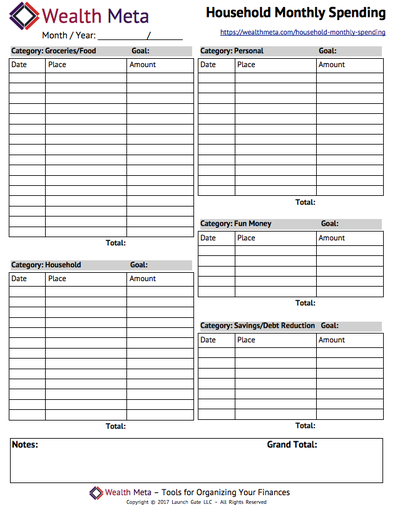 For couples who want to get on the same page financially leave this sheet on the kitchen table or somewhere you can both see it and easily add to it. 2) As you make purchases write them down. 3) At the end of each month add up the results, compare what items were worth it vs not, and plan for next month by printing a new sheet and adjusting goals accordingly.